Over the past four decades, Canadian artist Tony Calzetta has developed a bold style and a unique visual lexicon. 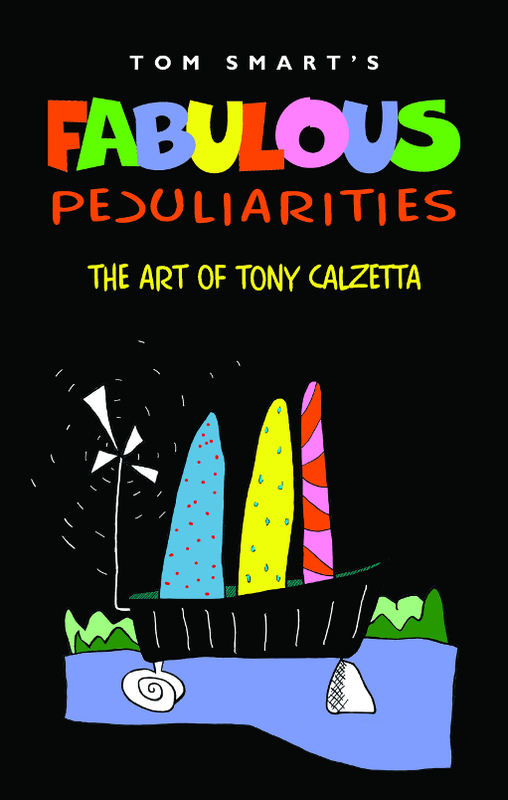 In Fabulous Peculiarities, veteran author, art gallery director, curator and columnist Tom Smart teases out Calzetta’s many and varied artistic influences. Smart also examines how the artist has made efforts to engage audiences in the interpretation of his works, resulting in unique and complex visual narratives. As Smart explains, the culmination of this interest in visual narratives is Calzetta’s collaborative livre d’artiste created with award-winning poet Leon Rooke and printmaker Dieter Grund: a zany, surprising masterwork entitled How God Talks in His Sleep and Other Fabulous Fictions. The book’s true focus is not just the art—it’s the story behind the art—and Calzetta’s influences and motivations are revealed. 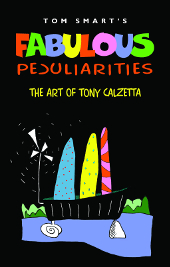 Tom Smart profiles the art and career of a notable artist in the penetrating analysis Fabulous Peculiarities: The Art of Tony Calzetta. The cover is based on an image by Calzetta called SNOOP, Protégé of Snap, and its vibrant, contrasting colors demand attention, setting the stage for a closer examination of this, and his other artworks. Calzetta’s art is of the type that is often immediately dismissed with the standard "My kid could do that!" line. But hidden in its simplicity are scores of decisions and experiments involving color, composition, and attempts to bring a dynamic sense of action to two-dimensional paintings. Smart discusses Calzetta’s early development in a way that probes deeper into the intent and meaning behind what appear to be simple, single-line drawings: "He practised a form of automatism—automatic drawing—that enabled him to put down in as immediate a way as possible his unconscious." The book is not so much a biography as it is a retrospective on the artist’s career, and as such, it traces his love of drawing, which evolves into painting, sculpture, and later, collaborations with other authors on innovative two- and three-dimensional book projects. In order to appreciate any art—but particularly Calzetta’s deceptively simple, often cartoonish-looking works—one needs a good guide. Smart proves adept and eminently capable of communicating why Calzetta made the choices he did, and why they are worthy of praise. Smart does so while mostly avoiding stereotypical art critic hyperbole, and the book is well designed, with plenty of photographs and reproductions of Calzetta’s work. It’s a simple enough feature, one that would seem a requirement for any art book, but one that often goes underutilized. The one drawback of Fabulous Peculiarities is, unfortunately, a significant one—with the exception of the cover, there are no color reproductions to be found. While the black and white images are fascinating in their own right, they eliminate a whole dimension of Calzetta’s art that is discussed throughout the book. Budget constraints often prohibit color interiors, but in a book focusing on an artist to whom color is a critical component, its absence is keenly felt and makes the book feel slightly less than complete. Still, the book’s true focus is not just the art—it’s the story behind the art. Calzetta’s influences and motivations are revealed, and even those who’ve never heard of him, or who wouldn’t ordinarily be attracted to his simple but thoughtful work, will find themselves captivated by Smart’s look behind the curtain. Horace, the ancient Roman poet born some two thousand years ago, was one of the first writers to compare the arts of painting and poetry. Advocating strongly for radical and innovative ways to appreciate literature, he encouraged readers to transfer to poetry the same qualities that give pleasure in painting and visual arts, evoke mood and stimulate thought. Just as paintings can be read and understood either through close viewing or from a distance, Horace proposed, so too one could decipher a poem with both a close reading and with an eye to the bigger picture—the piece as a whole. "Ut pictura poesis"—"As is painting," he declared, "so is poetry." This is a core idea that animates the drawings, paintings and prints of Canadian artist, Tony Calzetta, and which has inspired the poetry and prose of his author colleague, neighbour, friend Leon Rooke. Together, Calzetta and Rooke have bred book works whose parents are drawing, painting, printmaking and poetry. Their 2009–2010 offspring, How God Talks in His Sleep and Other Fabulous Fictions and Peculiar Practices are something else altogether: amalgamations of voices and styles, modes and meanings, that are truly operatic in their scope and that embrace many artistic forms. Their creative marriage began in 2007 when Calzetta, and Dieter Grund, publisher at Presswerk Editions, were casting about for a project on which they could work collaboratively. The discussion evolved to include Governor-General Award winning author Leon Rooke. Together, the trio set their sights on creating a livre d’artiste. The creative process, however, would be reversed from the usual flow of words inspiring images; during a lively conversation, Calzetta suggested to Rooke that he (Rooke) respond to his (Calzetta’s) drawings by writing whatever came to his mind and flowed through his pen. Drawing preceded word, resulting in a kind of word-based lyrical translation of the artist’s lines that were the muses for the poet’s imagination. Rooke chose nineteen and set down a suite of raucous tales. The image muses were selected from twenty-five studio sketches that Calzetta randomly selected from his production. Rooke’s mastery of language is matched by his absolute familiarity with poetry’s rules and conventions. Rather than be content with exploring blandness wrapped in simple poetic verse, his deep appreciation of form and craft takes him and his readers on trips across a wide rainbow comprising lyrics, odes, sonnets and just about every other way poetry is put together. 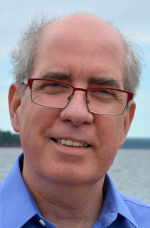 His bawdy, irreverent, humorous tales teach lessons by engaging the mind and body on equal terms. When paired with Calzetta’s prints, drawings and paper sculptures, a very mysterious thing occurs. It is as if the artist’s simple, abstract lines and odd, allusive shapes that float and sway in and around his prints, drawings and paper sculpture compositions turned into alphabets of very different characters. How God talks in His Sleep and Other Fabulous Fictions and Peculiar Practices explore the propinquity of image and word. The offspring of this creative mash-up of picture and poem is entirely new kinds of texts and objects altogether. The pages themselves have meaning in the very selection of components comprising the paper pulp—pulped dollar bills, twigs and leaves from Cézanne’s garden, for example. Primary colours of end papers dazzle brilliantly and clash with each other. Prints are made from etching presses and from ink jet printers. Scrolls and pop-ups, folded origami-like shapes all collide with cutout doodles. These are the icons of a wholly new way to read and write, and to make art. The manuscripts comprise suites of printed pages, made with the various technologies associated with woodcut printing, digital printing, and etching. Pictures rest beside typescript, sometimes enfolding it in pictorial parentheses. On other pages, texts of various sizes range around the page, complementing the images, and giving the sense of pictorial depth beyond the surface of the rag paper. The process of reading this manuscript is, in the first instance, visual. The experience of unlocking its meaning is sensual. As if they were clothing stripped away to reveal the body comprising text and image, things are taken away to unveil a truth. In and out, the focal points shift as letters and words emerge and recede in the imaginative spaces behind the picture plane, and as printed forms collide with one another in collage-like juxtapositions. The effect looks like two alphabets co-existing on the same page—one letter-based, readable and typographic, the other pictorial, hermetic and metamorphosed from a personal, expressive artistic style. Reading these two books leads inevitably to the questions: Where do these fabulous books come from? What are their artistic lineages? And what, if anything, do they mean? Let’s see what we can find out by taking a trip back four decades to the beginning of Calzetta’s career as an artist, and by tracing the development of his artistic career to the point where God talks in his sleep.